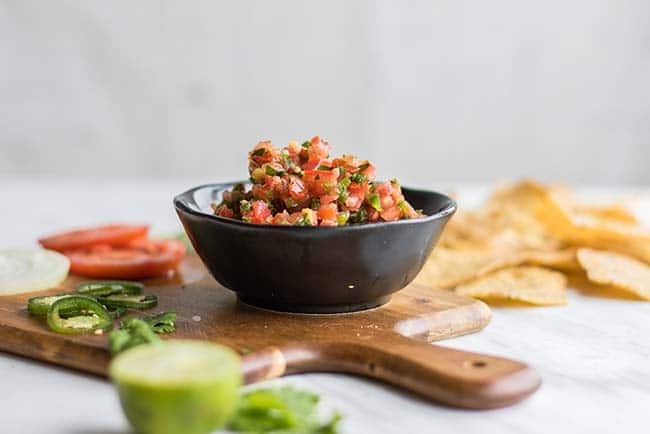 This Homemade Salsa Recipe is one of those you should have in your back pocket. The perfect partner to chips, but also a great topping for salads, tacos, and eggs. If you’re looking for a good spicy salsa recipe, I’ve got tips for adding in an extra kick! 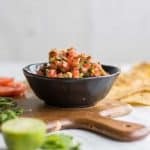 How Do you Make Fresh Tomato Salsa? There isn’t anything secret about the fact that homemade salsa, made with fresh tomatoes, is best salsa you’ll find. I have forever been a Mexican food lover. As a child, if it was my turn to choose the restaurant, you can bet it was Tex Mex. For my birthday every year, tostadas — my favorite dish, followed probably by my mom’s enchiladas. This love has followed me into adulthood, and unfortunately for my deep seated taco cravings, all the way to Asia, where salsa is often sweetened and corn tortillas are no where to be found. I’m one of those weird people who visit a new country and can’t wait to see what their local Mexican restaurant might have. Piece of honest advice: Don’t go to Asia and eat Mexican food. Just don’t. Living in Asia is part of what has turned me into a lover of making my own condiments. If you can’t find the flavors you’re craving, you make them yourself. I adore salsa. It’s the perfect topper to so many meals. Because I can’t swing by the local taco shop anymore, I try to make a batch of homemade salsa every couple of weeks. This salsa recipe is one I always come back to. 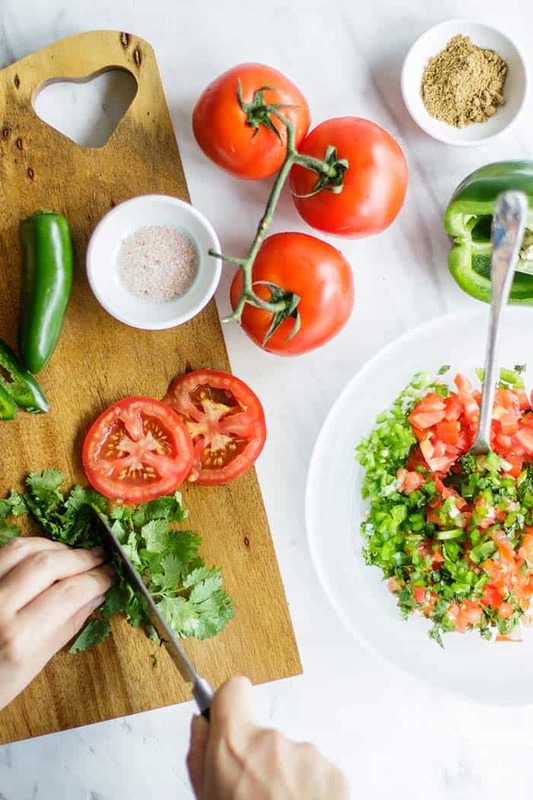 The worst thing you can do to fresh tomato salsa is add too many ingredients. Keep it simple. Fresh, vine ripened tomatoes (buy them on the vine if you can! ), jalapenos, a little onion, LOTS of cilantro (or if you’re one of “those people”, choose to omit it! ), and then lightly seasoned with lime, salt and cumin. That’s it. You’re done. I chop the peppers and onions up really small, add tomatoes and chopped cilantro, and then season with sea salt, cumin, and lime. Once I am happy with the balance, I throw it into the food processor for a quick whir. I like to have it mostly chopped up so that it doesn’t get mushy in the food processor– just a little mix to make it smoother. I’ve left this recipe intentionally classic, so it can be used as a multi-purpose topper. However, use it as a starting point, and add your own variations! 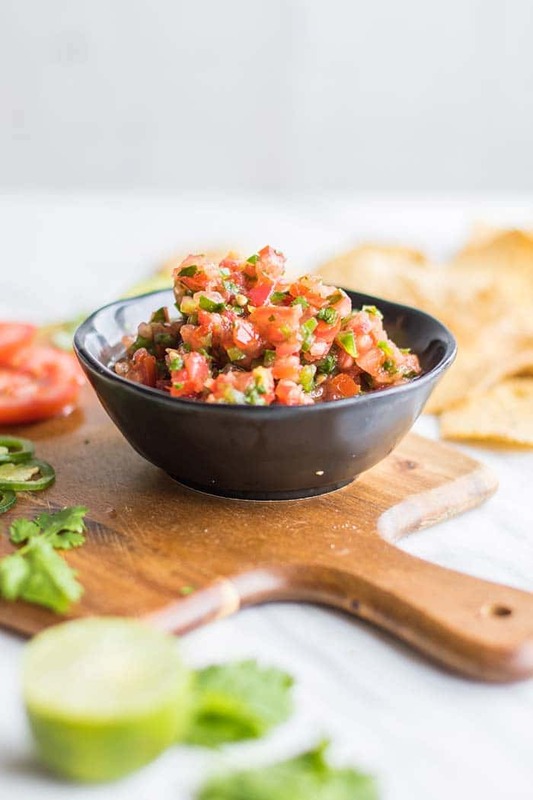 Kick up the Heat: If you’re looking for a spicy salsa recipe, omit the bell peppers, and use all jalapeno peppers in his recipe. You can also experiment by adding other peppers, like poblanos or hatch green chilis. For the Family: If you’re making this salsa recipe for kids, use more bell pepper, or add some sweet red or yellow bell pepper in place of the jalapeño. Salsa is a great way to entice kids to eat more vegetables. This basic salsa recipe is the perfect back-pocket recipe. Keep it classic, or add your own twist, I love to add cucumber or diced carrots to my salsa in the summer, and adding some pineapple or mango would give it a fun sweet twist. Start with the measurements below, and then adjust to your own taste. Chop all the vegetables finely, and add to a bowl. Season with lime juice, cumin and sea salt. Jalapeños vary greatly in heat, so the amount you'll need will depend on both your peppers and how spicy you like your salsa. Keep in mind that the oils from jalapeños continue to come out into your salsa as it sits in the refrigerator, so if your peppers are spicy, make the salsa slightly less spicy than you'd like it to be. Add your salsa to a food processor, and "pulse" it until it's the desired texture. This step is optional, but will give you a more restaurant-style salsa. I prefer to chop my vegetables finely first because allowing the food processor to do it will result in a mushy salsa. Store covered in the refrigerator for up to 4 days. This salsa is best enjoyed the first couple of days after it's made.